Which one of the two children do we want to be? Do you recognise the one who says yes but does not act, or do we want to be the one who at first says not going to do it, but changes his mind? Do we want to hear the voice of the Almighty one? Do we even listen to the voice of the Lord Jesus, who asks us to do the will of the Father? Do we are selves take our own steps and go the way Jesus directs us? There is only one person to whom we have to give the full authority and to whom we have to give our ear and heart fully. We have to fear the LORD of Lords, our God, and serve him, (De 6:13) and should listen to His wishes and His commandments. By serving God, Jesus obtained all the earthly authority which the devil offered him, and heavenly authority in addition thereto (#Mt 28:18). So much better are the rewards of God than Satan’s. The words “him alone thou shalt serve” need be recalled today. Jesus warned men against trying to serve God and mammon (#Mt 6:24). Jehovah had previously also brought His penalties over those who did not want to listen. 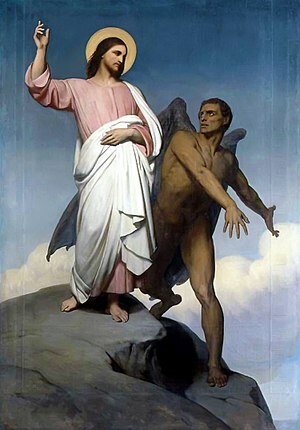 Evil or the devil, as the lord of the evil world, constantly tries to win men to the service of the world and God. This is his chief camouflage for destroying a preacher’s power for God. (The word in (#Mt 4:10) for serve is latreuseiv from latriv a hired servant, one who works for hire, then render worship. Lots of people are in a position they feel secure because they take no parts. They are sometimes member of a denomination, though they have a lot of things they do not keep up to the rules of that denomination. (Compare in the Roman Catholic Church where the Pope has given a lot of rules, but which the majority neglect) A lot of the actions and feasts they hold are pagan and contrary to the Biblical teaching. Clearly Jesus does not demand to pray to him but to his Father. Today we still can use the given model prayer “Our Father”. Let your Name be sanctified; Faithful Christians should honour the Name of the Most high. Jesus does not use the opportunity to incorporate the noma sagrada or Divine Name (YHWH = Jehovah; # Exodus 3:15) in his model prayer. Jesus uses the words “your name” with reference to the Father rarely in the Synoptic Gospels. In John the Nazarene uses the expression at John 12:28; John 17:6, 26. However, he never uses or pronounces YHWH in these contexts. Why? In Jesus’ day the Jews refrained from uttering the name YHWH and substituted Elohim (God) or Adonay (Lord). The Jews never removed YHWH from its nearly 7,000 occurrences in the Old Testament. About the year 1,000 CE Jewish copyists began to incorporate vowel points in YHWH to warn to say God or Lord in its place. Given the attitude of the Jews what would have happened if Jesus used YHWH in quotes or normal speech? Certainly equal to that misguided accusation that he violated the Sabbath! Yet the Gospels are silent on this. What about private meetings with his disciples when the use of YHWH could not cause a public stir? Compare the lengthy closing words in John 13$ to 17. Not once does Jesus use YHWH even though he alludes to the “name” four times. This does not minimize the importance of the “Name” as Jesus’ words in his prayer shows. The idea of this sanctification occurs scores of times in the Hebrew Bible. Compare Exodus 3:14, 15, 6:3. Various renderings are: TCNT: May thy name be held holy; MOF: thy name be revered; PHI: may your name be honored. “9 After this manner therefore pray you: Our Father which are in heaven, Hallowed be your name. 10 Your kingdom come. Your will be done in earth, as it is in heaven. 11 Give us this day our daily bread. 12 And forgive us our debts, as we forgive our debtors. Thou shalt worship the Lord thy God, and him only shalt thou serve. The worshipping or act of bringing worship can be done in different forms, which shall be spoken of in different articles. It can be done in the house by a private person or member of the community or in a special built or purpose-built place of worship, like a church or meeting room, or in a public place or in the open. In the Christadelphian community we mostly call the Meeting Hall “Ecclesia House”, “Ecclesia building” or simply “Ecclesia”.